Wine Review: 2009 King Estate Pinot Gris | Wine Splash! 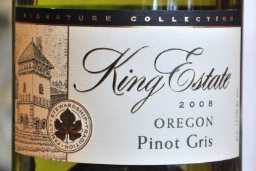 Finding some fantastic white wines in our cellar and came across the King Estate Pinot Gris 2009 (Oregon Signature). With the 2009 date, we thought it would be a good time to give it a whirl. Daybright and very clear in the glass. On the nose, lots of tangerine, ripe pear, and even a hint of floral and herb. Tantalizing to say the least! On the palate, pure bliss! Bursting with bright citrus, ripe pear, and soft green apple flavors…even a teasing of white peach and almond emerging on the finish. The mouthfeel was full with a perfect balance of fruit, herb, and acidity. Lingering finish which begs you to taste more! We drank this on its own but it would be a perfect wine with fresh summer salads, seafood, light pasta’s, and light to medium cheeses. We recommend that you drink this now if you have a 2009 in your cellar – or at least before the end of summer. So we do give this wine a 91 on our SiNoTas scale. (Sight, Nose, Taste). It really was the Trifecta for us in all senses and about as close to perfect as we have found. Going to seek out another 2009 this week and also the current vintage since King Estate always seems to be dependable in quality. WineSplashing! Learn more about their wine at www.KingEstate.com.